Grima6 Maverick Explantation - revision to fusion. During the lunch break today at SAS (see the blog), I ran to the hotel and called Lorna. (She asked me to tell her story.) She is the woman who has unrelenting leg pain for 3 years since L5-S1 Maverick. On Friday 20-April, Dr. Zeegers removed the Maverick and replaced it with a STALIF cage.. She tolerated the surgery well and seemed to have some improvement. However, at her 6 day visit, it was clear that there was more work that needed to be done. They knew this was a possibility and it seemed clear that a more thorough posterior decompression was needed and was performed on April 27th. Doctors Zeegers, Hoogland, and Baumbach weren't sure how much decompression would be needed, but interoperatively, it turned out to be a lot. While it was difficult to know exactly what was happening from the imaging, diagnosing the problem was straightforward for Dr. Baumbach, because the symptoms were so profound. Even so, they were surprised to discover how bad the stenosis really was. With the anterior only fusion and the amount of of posterior decompression needed, they decided to reinforce the anterior fusion with a coflex interspineous spacer. This will lend the extra stability, but is much less invasive than a posterior fusion. After the second surgery she knew immediately that much of the neuro deficit in her legs is gone. Her old leg pain is gone too. I was great to talk to her today because there was so much joy and hope in her voice. It's still early after 2 surgeries.. but things look good now. Hopefully, she'll be along later to update us. PS. 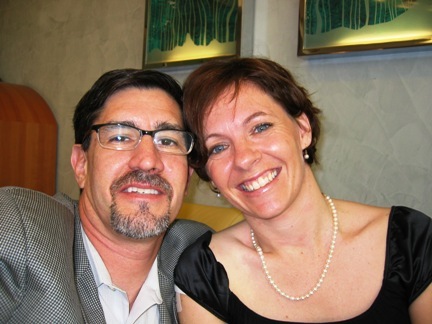 Before her first surgery, she ran into Sam at the AlphaKlink.... his story is updated on his GPN patient story page. Last edited by mmglobal; 05-02-2007 at 02:38 AM. If Lorna had been in the US, what would her options have been? It's wonderful to hear that she had the type of attention and care that afford her the best possible option to avoid a more invasive surgery. Best wishes to her with her continued progressive recovery and look forward to updates if and whenever possible! Re the SAS blog~ looking forward to more when you've time.. was reading in the Sun.LA Times about property prices in Berlin and how it's the in place to be/live now (and hopefully a job market will be happening one day). Last edited by Maria; 05-02-2007 at 08:24 AM. The 1/2 sentence above was written by Lorna. Then, I got called away and had to take my computer. I was hoping we'd connect again so she could finish, but she's back to her hotel already. Lorna will come and post again soon to give whatever level of detail she wishes. The short version is that she is much better than when she arrived. She's had some challenges that have been unpleasant, but as you can see below... she's still a happy camper. She'll still be here for a while as this incredible team helps her get her life back. All-in-all, the explantation of the Maverick was difficult but successful. That is great news. I hope Lorna's recovery continues apace. That smile says a lot about how she is doing. I am wondering what was wrong with the MAverick disc. Was it improperly implanted? Or just bad luck that it touched a nerve??? That smile says a lot. I so wish her well and hope her pain issues have finally been resolved. As for the others, well, let's hope they're transient and will disappear without much fanfare. I still need to get Lorna to fill in the details, but surgery #x was the Maverick explantation and fusion 6 weeks ago. Surgery #x plus some more was yesterday. Lorna had a single-level Mobi-C implanted and here is what she looked like at about 12 hours post-op. This is an amazing case and I can't wait to see what Lorna writes and to watch the discussion unfold. My client is recovering well from his surgery. I'm at the end of of a grueling month and look forward to being able to post more.